A number of restaurants and other businesses across D.C. and the nation are closed or operating on restrictions today as part of the “Day Without Immigrants.” The protest is part of an effort to show the impact immigrants have on daily lives of Americans, and was spawned out of President Donald Trump’s new immigration policies. At least two Reston restaurants are showing their support. 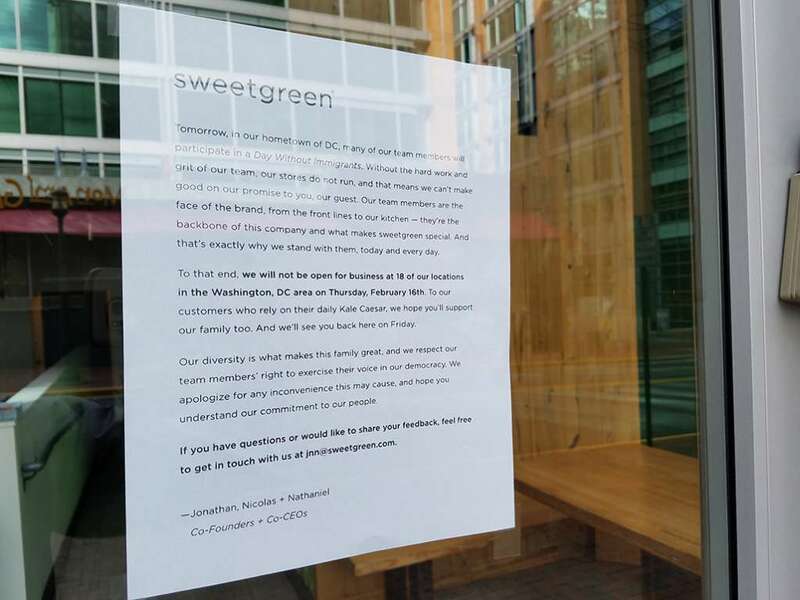 Sweetgreen (11935 Democracy Drive) is closed for the day, as are all of the company’s 18 locations in the Metro area. Meanwhile, PassionFish (11960 Democracy Drive) says its menu options may be limited Thursday as part of the protest. Due to today’s observance of #ADayWIthoutImmigrants, some of our menu items are limited & seating may be modified. Thanks for your suppport! A representative for PassionFish owner Passion Food Hospitality said the Reston restaurant is “not particularly affected” and “most staff” would be working Thursday. “[Management is] supportive of their staff on whichever decision they choose,” said spokesperson Meg Malloy.